HELP US SAVE $ & PAPER View this month’s schedule online! Les Mills Launch! 5 6 us online 5 Become a Red Cross Lifeguard. FIND Search 'krocquincy' for the latest 6 Kids take aim in Archery classes. info, photos, stories, & more. 7 Golf Academy starts this spring! Hours subject to change without notice. Call 217-222-5762 or go to KrocQuincy.org/hours for more info. *Open for all ages. Some spaces may be used temporarily for scheduled classes. Availability subject to league and/or tournament play. Please see page 6. Check out our new Grab & Go items! Smoking, tobacco products, alcohol, and vulgar language are not permitted on the premises. Animals (except for service animals), bicycles, skateboards, skate shoes, or online skates are not permitted. Members or guests using the facility under the influence of alcohol or drugs may have their membership revoked or modified indefinitely. Strollers not allowed on the walking track Monday–Thursday 5–7pm. Ages 12 & up allowed in The Ledge alone. • A signed waiver is required. • Ages under 12 must be supervised by a guardian at least 15 years of age. • Guardian supervision NOT required for members with children ages 6-11 providing they check-in at the Welcome Desk, receive an arm band and remain on site. *Huck’s Hideout Child Watch is available for up to 2 hours per day for ages 6 months to 7 years while parent/guardian is using the facility. All current members, in good standing, may use the venue for free while adhering to the time parameters. Non-member guests may purchase day passes for $6 per child, good for 1 session up to 2 hours. A signed facility usage waiver is required. Class or activity fees and registration deadlines apply. VIRTUAL CLASSES ARE FREE FOR MEMBERS & DAY PASS USERS. PLEASE REGISTER AT THE WELCOME DESK. DROP-IN AND ROSTER Stop in and register at the Welcome or Control Desk. This is the best way to make sure you are in the correct class and that all paperwork is completed ahead of time. At this time, Drop-In Classes are ONLY available for purchase in person at our Welcome and Control Desks. DIAL 217-222-5762 and pay by credit card. This reserves your spot in the class or activity of your choice. You must also fill out a program enrollment form available at either of our courtesy desks. It is a good idea to come at least 15 minutes early to your first class to get this done. Avoid the lines: 1. F ind your Class Registration # in the current Program Guide 2. Go to www.KrocQuincy.org 3. Click ‘Register for Roster Classes Online’ 4. Search for your class and register  emember to print-out and bring R your receipt and waiver with you. Ages 11 & under MUST have a parent/guardian present. Ages 12–15 MUST have a parent in the building. Ages 16+ may be alone. *Additional shoe or rental charges may apply. Signed waivers are required. Lap lanes may be available earlier than scheduled depending on program registrations and are subject to closure due to various facility events. Lap lanes closed during group swim lessons. See times below. SWIM LESSONS Lap lanes closed at these times. Join the Aquatics Facebook Group for updates! Introduces beginning swimmers to the water in a fun setting. Learn floating, self rescue techniques, and water safety through play and repetition! Children under 11 years old must be accompanied by a parent/guardian 18 years & older in the aquatic center (some exclusions apply. Ask us about our Pool Pals program). Ages 12–15 years old must have an adult present in the facility. Ages 16 years & older may use the facility unattended. POOL PALS CHILD WATCH: Children, ages 8–11, of members are allowed to enjoy our Aquatic Center while their parent or guardian exercises in another area of the building. Member parent/guardian MUST remain in the facility during this time. Lap Swim Both lap lanes are available for lap swimming. Lanes available on a first come-first serve basis. Three adults can fit in one lane-please share. Circle swim required when sharing a lane. Water jog is allowed (up to 3 lap swimmers). Children must have adult with them in the same lap lane to swim laps. Basketball/volleyball are not available. Big Red Slide Open for those at least 48" tall and under 300 pounds. Lifeguards will measure all riders. Sprays & Fountains Play features: sprays and fountains will be on. Open Swim Open for all ages. Some spaces may be used temporarily for scheduled classes. Full Open Swim All play features: sprays/fountains/waterfall on. Basketball/volleyball is available. Lap lanes closed. No food or drink, besides water in closed containers, allowed in the Aquatic Center. Shoes may NOT be worn in the pool area. Call ahead for lap lane availability at 217-231-5619. STAY CONNECTED GET TEXT UPDATES! Text KROCQCY to 51555 to receive mobile updates. Valid for members and non-members. Applicable days and times are shown in DARK ORANGE to the right. to help children & parents/guardians get healthy together, you are invited to bring your child (ages 8+) to select fitness classes. USAGE GUIDELINES: Proper work-out attire is required, including closed-toe athletic shoes. No jeans allowed. No food or drink, other than water in closed containers, is allowed in the fitness, gymnasium, weight, and track areas. Please be courteous to other members and arrive on time. Instructors may deny access to class if you arrive after the warm-up period. The RJKCCC reserves the right to cancel any class on the basis of low attendance. Drop-in group fitness classes are first-come, first-served. All participants must check-in and pay (if applicable) at the control desk. Participants may check-in no sooner than 30 minutes before the start of class. LES MILLS VIRTUAL CLASSES AVAILABLE! Les Mills BODYCOMBAT, BODYFLOW, BODYPUMP, CXWORX, SH’BAM, RPM, LES MILLS GRIT, and BARRE are available. Class capacities and age guidelines apply. 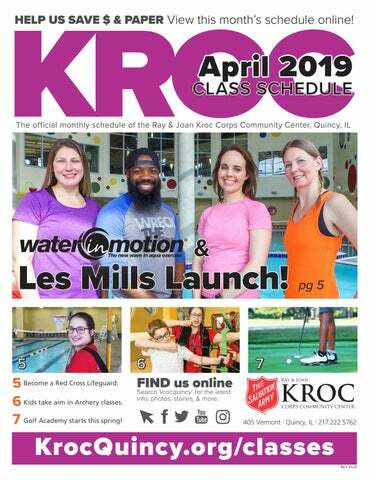 Please register at The Kroc Center’s Welcome Desk before attending a Les Mills virtual class. GROUP FITNESS AGE GUIDELINES: Ages 13+ are allowed to attend all other group fitness classes. CLASS CAPACITY: Participation numbers limited due to equipment and space constraints. *PARTY CYCLING: Designates certain Kroc Cycling Party Classes which may use black lights, lasers, and a fun party atmosphere. REGISTRATION: Participants may only register for back-to-back drop-in group fitness classes that have 15 minutes or less between end and start times. LES MILLS™ and its respective classes: BODYPUMP™, BODYCOMBAT ™, BODYFLOW ™, CXWORX ™, are trademarks of Les Mills International LTD, used under license. POUND® and Ripstix® are registered trademarks of Pound Rockout workout, LLC. ZUMBA® is a trademark owned by Zumba Fitness, LLC used under license through certified instructors. GYM CLOSED, full court use. OPEN VOLLEYBALL 1–4pm Half court use if court is not already occupied. Net is available upon request. Kroc Golf Academy meets at Knights of Columbus Par 3 Golf Course. Karate meets in Bluffs C & D.
*Private music lessons include: guitar, ukulele, piano, brass, woodwind, and percussion. An opportunity to play in graded brass and vocal ensembles. 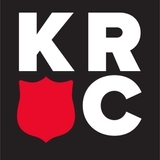 Transportation provided from the Kroc Center to St. Louis. Depart at 6am, arrive at St. Louis gateway Corps at 9am, arrive back at The Kroc Center at 3pm. Lunch is provided. Start registering for Camp Mihaska! Featured movies are listed on the Welcome Desk movie reel. CLUB LEDGE: TOURNAMENT TUESDAYS 4–6pm The Ledge, All Ages Join in on a FREE tournament for a chance to win a prize! Connect with staff & friends through interactive games and activities! See KrocQuincy.org/camp for info. Dates subject to change. The black lights come on and the music turns up! See Arts & Ed listing for more info! TEEN L.I.F.E. 5–8:30pm Canceled April 19 Grades 6–12, Bluffs Teens develop a closer relationship with God and grow as individuals while exploring ideas, values, and faith within a supportive community. Weekly 2–6pm Transportation for ALL Quincy area schools included. Every Saturday, memorize & correctly recite the weekly Bible verse to receive a free soda pop! Check KrocQuincy.org/education for details. Days and times may vary. GRADES K–6 Hot lunch & snack, Aquatic Center, interactive game room, gym, engaging Bible lesson, science & discovery, camp games, movie, and free play! BUNNY HOP 10–Noon, April 20 See back page for details! Parent/guardian must bring their child/ children on distribution day. Held in Meadows. Choosing the perfect membership for you and your family is easy. Visit KrocQuincy.org/membership to download a membership application, or pick one up at the welcome desk. Applications and payment can be submitted to the welcome desk. & TRY OUR GROUP FITNESS CLASSES FOR FREE!!! MONDAY & TUESDAY, APRIL 15 & 16 Les Mills classes will be FREE for Members and Non-Members. See page 5 for class listings. Ages 8+. Q&A: QMG Dietitian A Quincy Medical Group Dietitian will be talking about what foods can benefit your health and energy levels. Healthy Aging Monthly Seminars are free and open to the public! Join us for an Easter celebration with treats, games, crafts, activities, and Bible lessons! KROC GOLF ACADEMY STARTS! Starts the week of April 22 $ 55 per person, Ages 6+ Lessons are played at the Knights of Columbus Par 3 Golf Course located at 700 South 36th Street in Quincy. See list of days and times on page 6. Register at The Kroc Center!